The brothers Biega planned it this way: all three are skating for the Crimson. Hard-skating brothers Danny, Alex, and Michael Biega (left to right) spray ice chips at Bright Hockey Center. Sibling rivalry can inspire, but sibling unanimity has some impressive virtues, too. 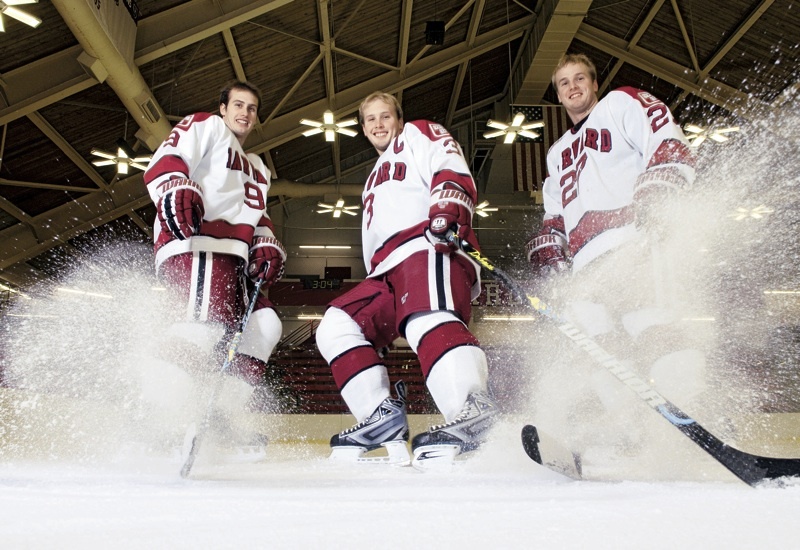 Consider the brothers Biega—Alex ’10, Michael ’11, and Danny ’13—of Harvard’s ice hockey team. All hail from Montreal, Canada, and have been playing sports together most of their lives: ice hockey, soccer, and rowing, for example, at Salisbury School, a small, all-male private school in Connecticut with some formidable athletic teams. The Biega triumvirate all played on New England championship hockey teams there—Michael’s goal off a rebound from Alex’s shot won the school’s first title—with Alex and Danny chosen as captains and Alex and Michael successively honored as Salisbury’s athlete of the year. All three hope to play professionally in the National Hockey League (NHL). Yet the brethren aren’t clones: Alex and Danny are defensemen, and Michael’s a forward. As a freshman, Michael notched a hat trick against Yale, and last year, with six goals and 11 assists for 17 points, was right behind Alex as the team’s third-leading scorer. (Forward Doug Rogers ’10, at 8-13-21, led the Crimson.) Michael and Alex joined forces on a power-play unit that was best in the Eastern College Athletic Conference (ECAC) with 19.2 percent effectiveness, scoring 24 times in 125 chances. This year, the Biegas will apply their skills amid some fine company. The Crimson’s top seven scorers have returned, along with Kyle Richter, who led all ECAC goaltenders in 2007-2008 with a 1.82 goals-against average and .935 save percentage. Eight freshmen have arrived whom Alex calls “immediate impact players.” He adds that the “team chemistry is great. In my four years here, I’ve never seen the team this tight before.” This year’s revised academic calendar, which places exam period before the Christmas break, should also help Harvard with its January and February hockey schedule—including the annual Beanpot tournament, which tough competition and January exams have made into an elusive prize. Last year’s Beanpot had a Biega Moment when Harvard trailed Boston University, 4-3, with only seconds left in the first game. Danny was watching on TV at Salisbury. “Harvard called a time-out,” he recalls, “and I see Alex and Mike. All I can see on the camera is M. BIEGA and A. BIEGA—they’re talking to each other. You could tell they were working up some kind of plan, some kind of play. The puck dropped, Alex passed to Mike, Mike passed back to Alex—and he scored! I was in my dorm room with 15 or 16 other kids, who all know Alex and Mike, and the room just erupted.” As it turned out, the game clock had ticked down to 0:00 just before the goal, so it did not count and BU went on to win the Beanpot (and, later, the national championship). But the moment was electric.